Johann Lamont warned Alex Salmond independence would mean 'Standard Life no more'. Scottish Labour leader Johann Lamont has warned that "jobs will leave Scotland" in the event of independence. Ms Lamont made the claim after financial giant Standard Life announced it was considering moving some of its operations out of Scotland as part of contingency plans being lined up ahead of the September referendum. Speaking at First Minister's Questions at Holyrood on Thursday, she riffed: "Standard Life no more, RBS no more, shipbuilding no more," a play on the lyrics of the Proclaimers' hit Letter From America. The song declares "Bathgate no more, Linwood no more/ Methil no more, Irvine no more". The Edinburgh-based pensions and savings firm revealed on Thursday it had started work to establish additional registered companies to operate outside Scotland, into which it could transfer parts of its business. Ms Lamont said that showed that a Yes vote would be a "disaster for Scottish jobs". Mr Salmond insisted an independent Scotland would be a "more competitive place to do business". But Ms Lamont challenged him to "admit that if Scotland leaves the United Kingdom, people's jobs will leave Scotland". She said: "Standard Life has made plans to leave Scotland if Scotland leaves the United Kingdom. "How many more companies need to leave Scotland before the First Minister admits a Yes vote would be a disaster for Scottish jobs?" The First Minister said: "I think our submission will be that Standard Life will find Scotland a good place to do business - as it indeed does business in 10 countries around the world. "Is it really the case Johann Lamont is making that Scotland is not going to be a good place to do business? "Because the evidence tells us, and it is substantial evidence, that not only will it be a good place to do business, an independent Scotland will be a more competitive place to do business." 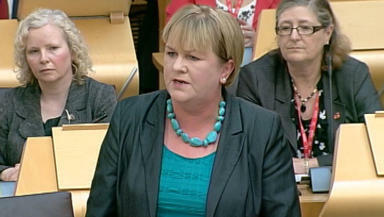 Ms Lamont was first to press the First Minister on the issue in what were, at times, heated exchanges at Holyrood. She accused the SNP leader of" denial, deception, delusion" on the issue. Holyrood's Presiding Officer Tricia Marwick rebuked the Labour leader, telling her: "Deception is not acceptable in the chamber." Ms Lamont responded "It certainly isn't, and it isn't in real life either." She continued her attack on the First Minister, telling him: "Standard Life employs 5000 people in Scotland, it is worth nearly £250bn. "Ninety per cent of its customers are in the rest of the UK. Now, Standard Life is actively making plans to leave Scotland if the First Minister gets his way. "No amount of bluff, no amount of bluster and no amount of bullying from Alex Salmond can change that fact." She said it was "precisely because Scotland is a good place to do business we want Scotland to stay strong in the United Kingdom, in the currency union we have now". The Labour leader went on: "It's not just Standard Life, the Royal Bank of Scotland - the bank the First Minister used to work for - the Royal Bank of Scotland has said the uncertainty is damaging their fragile business. "Standard Life planning to leave, RBS shedding Scottish jobs. When the First Minister said he didn't mind Thatcher's economics, he really wasn't kidding." She insisted: "Isn't it the case that Alex Salmond's plans would do more damage to Scotland that even Margaret Thatcher?" But Mr Salmond argued Standard Life would "find Scotland a good place to do business". He added: "That will happen first and foremost because of the excellence of the staff, that's its prime asset the 5,000 people who work in Scotland, that's the strength of the company and has made it successful. "And secondly, of course, because the Scottish Government puts forward the concept of a shared currency and regulatory framework which is exactly the sort of things Standard Life have been calling for." The First Minister went on to tell Ms Lamont: "The bluff, the bluster, the bullying applies to George Osborne, who is the Tory Chancellor she is in alliance with." He told MSPs: "We have been here before, Standard Life in the past have expressed concerns. In 1992 the managing director of Standard Life wrote to every single employee saying any constitutional change would be damaging for their business and cost jobs." But he said by the time of the devolution referendum in 1997 "they had changed their mind as experience showed them constitutional change could offer a secure business environment". He also said others "major figures" in the financial sector "recognise that the operation of their business in an independent Scotland could be highly successful". Mr Salmond cited RBS chief executive Ross McEwan as having said the bank "operates in 38 countries, and an independent Scotland would make it 39" and Barclays chief executive Antony Jenkins as having said it could "make it work" if Scotland left the UK. He went on: "In the past when we were faced with businesses who had concerns, who had doubts, then the answer of those supporting constitutional change was to demonstrate by evidence and experience Scotland would be more successful. "That is what has been done in the past and that is what will be done with the independence debate."